Pre wash was 45 x 22 cm after washing 10 x 19cm. 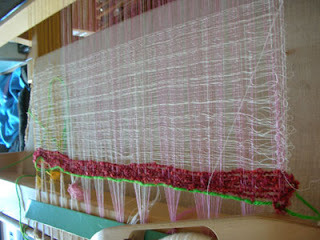 I guess it is OK woven. i need to concentrate more as i keep losing my place and getting mistakes. The colours are also not good but OK for a sample. No worries Avi will wear it! 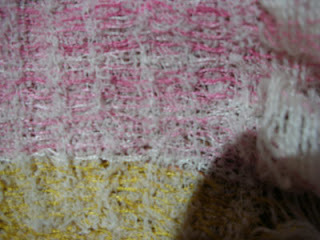 I received a new book today Anne Fields collapsed weave. Some good information in it but I must say the photography is not good and the editor didn't do their job very well. I will work my way though a few of the drafts and see what I can achieve. 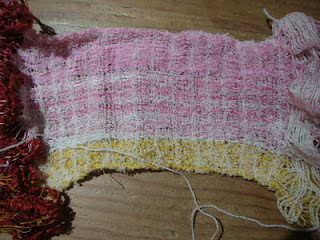 Maybe a bit of felting tread with it. I also have some horse hair to play with, what shall I do? Sorry photos a little blurry. 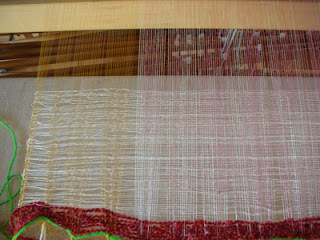 Well a new project but an old warp. I think I have had this warp end for at least 3 years and how need to use up all those bits and pieces that lurk in the back of the studio. I think the treads are silk rayon that is definite and possibly cotton. And a waffle weave tie up. 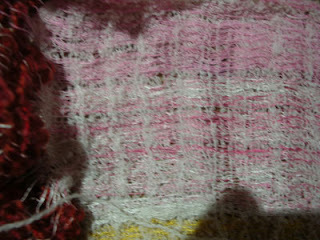 The sample I have woven is with over twisted yarn but now That is so boring what suggestions can you come up with?????? ?